If a movie puts a man who’s threatening to take the big leap from a ledge some 200 feet above a New York City sidewalk, it’s reasonable to expect that some tension will follow. In the prosaically titled thriller, Man on a Ledge, director Asger Leth does create a bit of tension, but the movie that surrounds the title character is too painfully improbable to keep eyes from rolling. 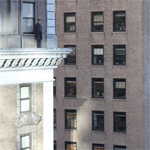 Instead of the tightly focused picture its title suggests, Man on a Ledge turns out to be an unsatisfying mixture of vertiginous teases, heist-movie ploys and good cop/bad cop moralizing. Sam Worthington, of Avatar fame, plays Nick Cassidy, the man on the ledge, a former New York City cop who was sent to prison for stealing a valuable diamond. The screenplay by Pablo F. Fenjves quickly shows us how and why Cassidy wound up on the ledge, where he spends most of the picture. I won’t burden you with a plot summary, except to say that Cassidy, his brother (Jamie Bell), and his brother’s girlfriend (Genesis Rodriguez) are involved in a preposterous scheme that’s supposed to prove Cassidy’s innocence. If you’ve seen even a couple of movies, you’ll quickly be able to separate the bad guys from the good guys, but I’ll give you a rapid rundown of the supporting cast, which includes Elizabeth Banks (as the detective called to talk Cassidy off the ledge); Edward Burns (as a skeptical cop who doesn’t think Banks’ character is up to the job); and Anthony Mackie (as Cassidy’s former partner and purported best friend). Special mention needs to be made of Ed Harris, who plays David Englander, the real-estate tycoon who owns the building where Cassidy stages his ledge stunt. Englander’s greed and insensitivity are so blatant, they stand out like an overly wide and aggressively garish tie. Getting a bad — i.e., caricatured — performance from an actor as gifted as Harris takes some doing, but Leth manages it. Other annoyances crop up: Bell and Rodriguez banter in ways that are neither funny nor believable, and the standard crowd gathers to encourage Cassidy to jump, thus ensuring that a major cliche gets its unruly due. I wasn’t sure what to make of Kyra Sedgwick, who plays a hard-bitten New York TV reporter. Sedgwick’s Suzie Morales roots for the most lurid and gripping possible story. It didn’t take long for me to begin to share Suzie’s point of view. So if I was at all tense by the end of this one, it was probably because I was waiting for someone to talk me down from the ledge of disbelief.